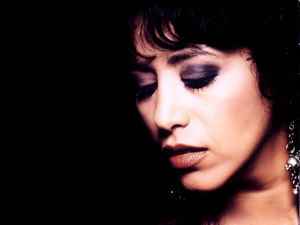 Ofra Haza (Hebrew: עפרה חזה) was a highly successful Israeli pop icon whose rags-to-riches career started in 1983 when she came second in the Eurovision Song Contest. She released 16 gold and platinum albums. She was born 19 November 1957 in Tel Aviv, Israel and died 23 February 2000 in Ramat Gan, Israel of an AIDS related illness. When I start to listen the voice of Ofra Haza..., I can't stop! Greetings from Warsaw -Michał Zygmunt Miszczak. A beautiful woman, beautiful voice but ending life in sad circumstances (reportedly dying of AIDS) - the one eternally carved into 80s generation with 'Im Nin Alu' - ethno-pop hit which stormed the charts around the globe and back. Unique but as equally stereotyped, especially within the goth-circles; The Sisters Of Mercy in particular, capitalised on Ofra's mermerizing solos during a neverending version of 'The Temple of Love'. However, Andrew Edtrich was no fool when choosing her - no other female pop-vocalist could have sang it better than Haza did. R.I.P.